Nepalese Whole Wheat Steamed Veg Momos are very popular street food in Nepal and in the Northern part of India. 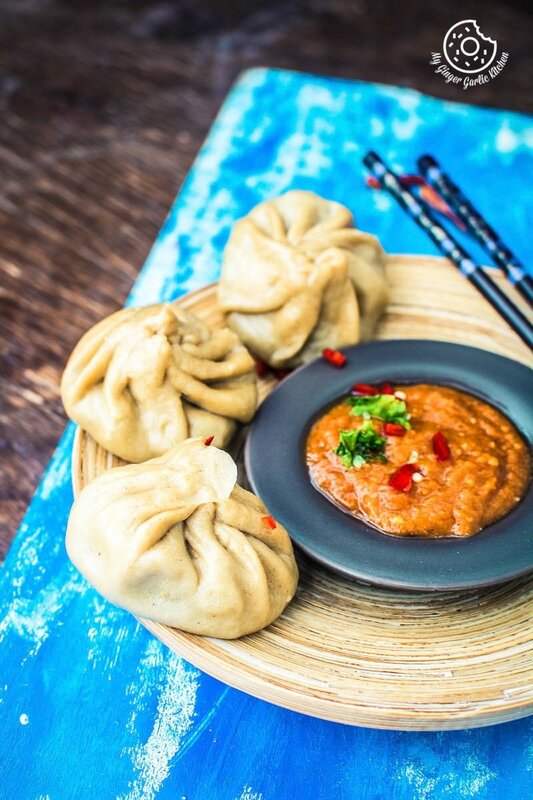 Momos are brilliant as a snack, but they can also make a light and pleasant meal for any time of the day. 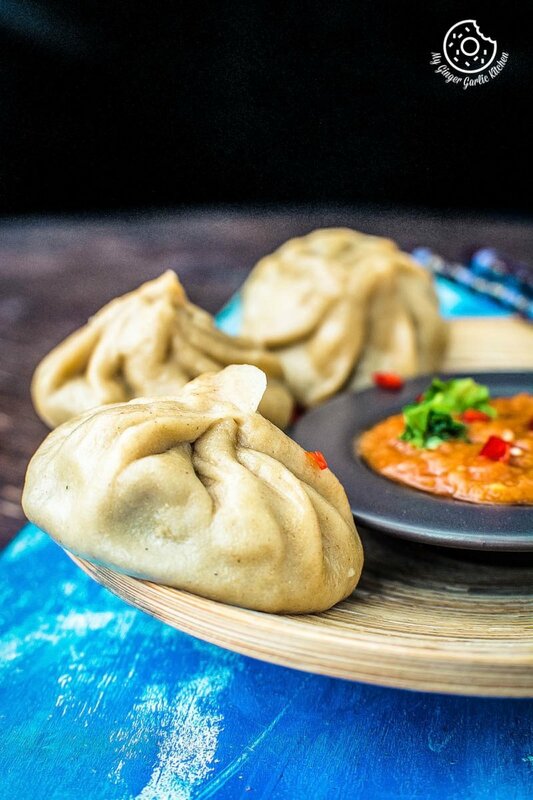 Learn to make popular Nepalese Whole Wheat Steamed Veg Momos with all the step by step video instructions. Happy almost weekend to you. Well, I know it’s only Thursday, but you know I love Fridays. I have written it so many times. MUAAAHH, I love Fridays! There are 3 main reasons of loving Friday more than any other day. First, on a Friday, the whole day you think about the weekend, isn’t it? So weekend already starts on Fridays, unless you have an essential meeting. Third, Friday dinner is always something different and special. Earlier, it was an untold rule in my household — there will be a pizza for Friday dinner. Any kind of pizza, but it should be a pizza. However, that situation has gradually changed over the past few months. Presently, Friday dinner doesn’t have to be pizza, it could be anything — the only criteria is that food should really be fancy. Coming to today’s recipe; last Friday I made these easy peasy and quick, nutritious and healthy Nepalese Whole Wheat Momos for dinner. And I served them with Spicy Chili Chutney which is traditionally served with these Momos. I adore all type of momos, but steamed momos are still one of my favorites. Because they are so light on the stomach, they taste so good. I also love the fact that they do not contain any white flour because they are made with whole wheat flour. They are steamed. And they have lots of veggies. Well, who won’t’ love a meal which is super tasty and super delicious at the same time. Isn’t it? 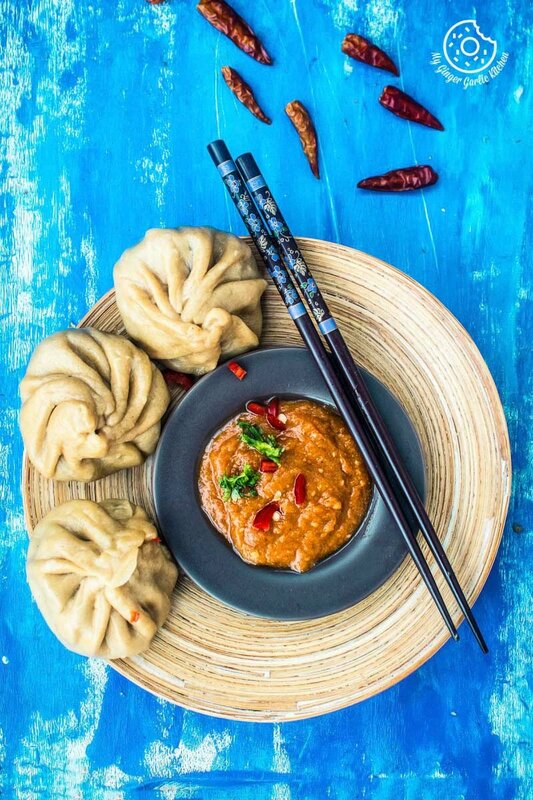 A little intro of steamed momos: Nepalese Steamed Veg Momos are bite-sized savory steamed dumplings. I am using the raw stuffing for making these Nepalese Whole Wheat Momos — it is the way it is prepared in Nepal. I have learnt this recipe from a friend who belongs to Nepal. This stuffing has the goodness of cabbage, carrots and bell peppers and spices. You can also sauté the stuffing for this recipe. You can check out the recipe I have previously shared for sautéed stuffing. 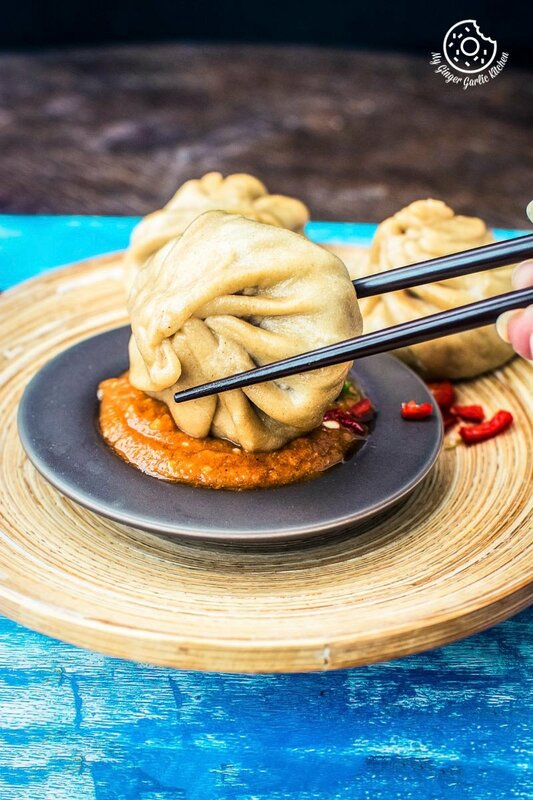 I won’t take much of your time in describing the origin of these momos. 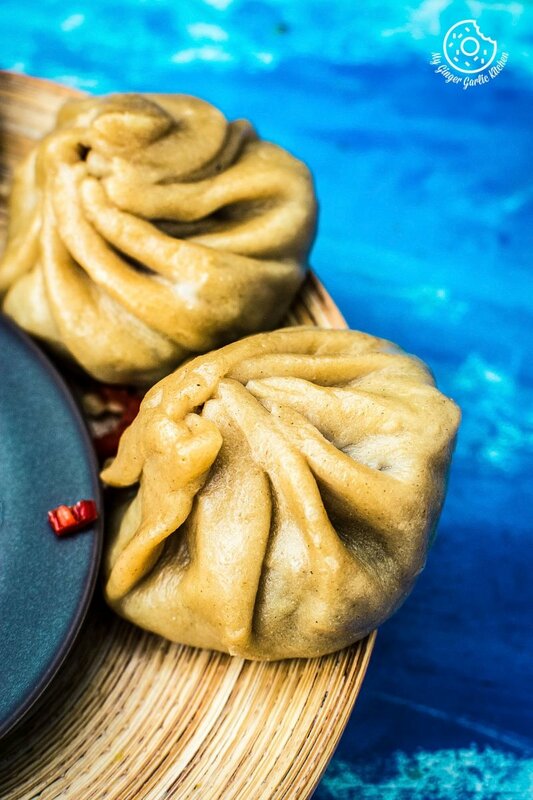 If you want to know more about them, you can check out my previous post about steamed momos. There are many varieties of savory momos/dumplings depending upon their filling and their cooking techniques such as steaming, frying and boiling. Momos are also known as dim sum, wontons. Today I am sharing a veg version of these, but they are also made with different stuffing such as chicken, minced meat, lamb, mushrooms, veggies+tofu, shrimp and many more. I made this recipe from scratch. Making them is not so much time taking and tough. Folding/ dumplings might be tricky for some, but with a little practice, you can achieve the desired results. I personally like to do the pleating part — that’s so artistic and beautiful. You can also watch the video of 9 ways of wrapping dumplings I have shared earlier. Another good news is that making these momos do not demand of any tricky kitchen gadgets. Just a simple rolling pin and a bowl of water is all you need to create the most tempting and enticing momos. I personally prefer to keep the spice level slightly low, because momos are usually served with spicy chutney. 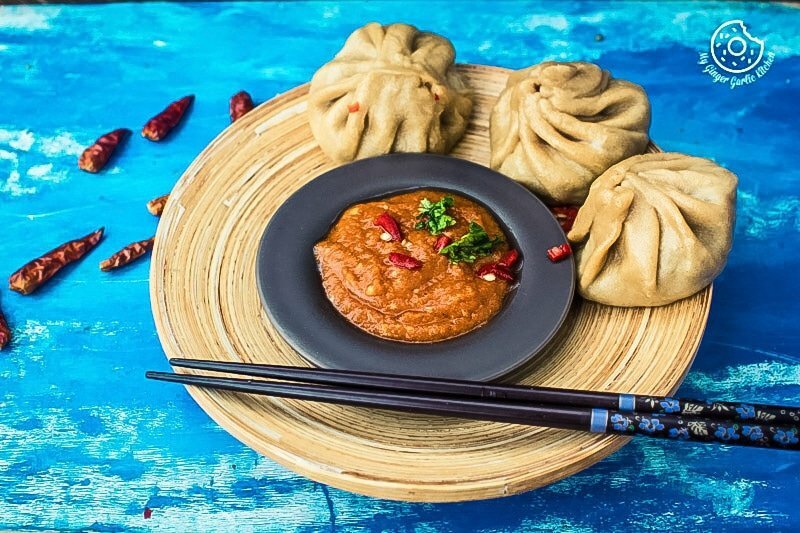 Less hot momos with hot chutney is a perfect harmonious pairing. 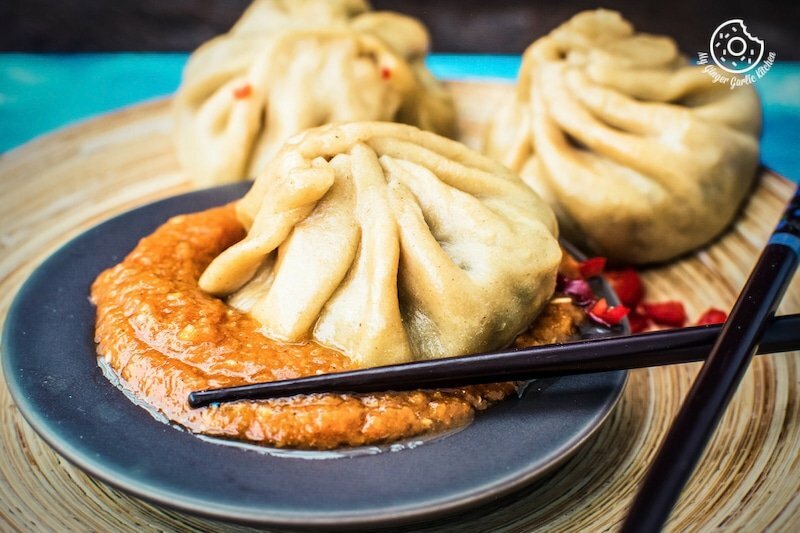 So are you ready to make these tasty and healthy Nepalese Whole Wheat Steamed Veg Momos? If yes, then get ready to take your tongue on a joy ride of sweet and spicy flavors. 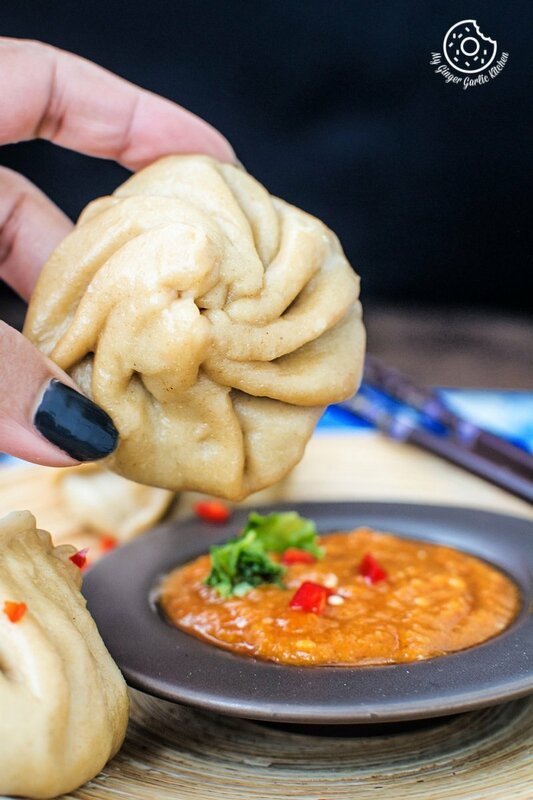 Let’s learn how to make Nepalese Whole Wheat Steamed Veg Momos by following these easy steps. Nepalese Whole Wheat Steamed Veg Momos are very popular street food in Nepal and in the Northern part of India. Momos are brilliant as a snack. 1. Combine all-purpose flour, salt, and oil in a mixing bowl. Mix well. 2. Add milk and mix well again. 3. Now add enough water to make a smooth dough, just like the chapati dough. 1. Add shredded cabbage to a bowl. Add salt and mix well. 3. Add shredded carrots, bell pepper, spring onion greens and mix well. 4. Now add the chili sauce, the soy sauce, vinegar, ginger-garlic paste, salt, and mix well. 5. Now add black pepper and mix well again. 1. Divide dough into 14-15 equal sized balls. Dust them with some dry flour. 2. Roll each dough ball thin into about 3″ circle, or until almost translucent. 3. The edges should be thin. Roll all the balls. 4. Wet the edge with some water. 5. Place about 1 tbsp filling in the center. 6. Bring one edge and start pleating as shown in the video above. 7. Twist to seal the dumpling. Stuff the rest of the dough balls in the same way. 8. Heat water in a steamer or a pan. 9. Cover the steaming basket with lettuce or cabbage. 11. Place the steaming basket over the steamer or pan and steam for about 10 minutes. 12. Serve with spicy momos chutney.